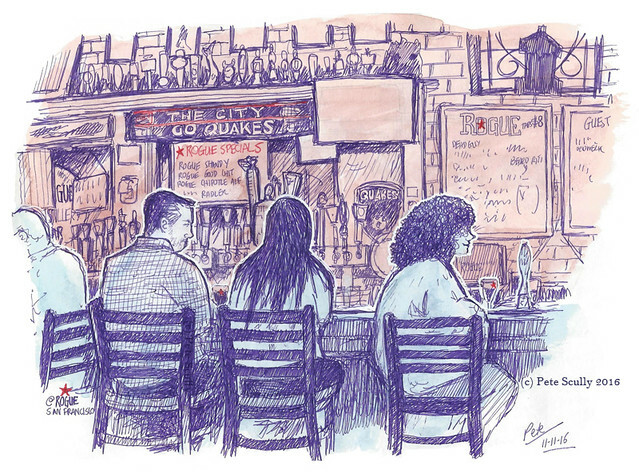 I’ve sketched this bar before, but only from the outside. 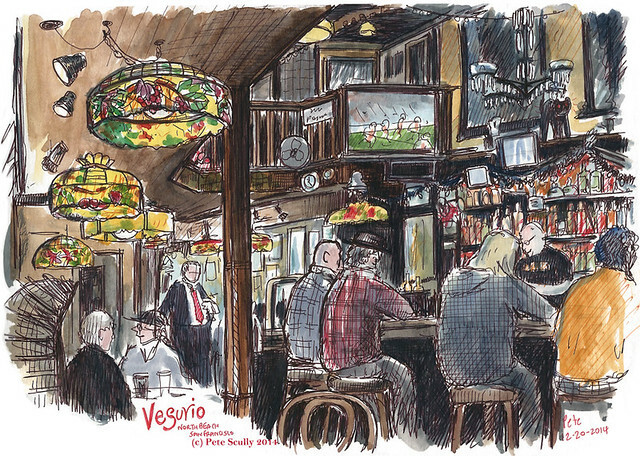 I always wanted to sketch inside, for it was an old North Beach drinker, with a distinctive v-shaped bar and authentic character. 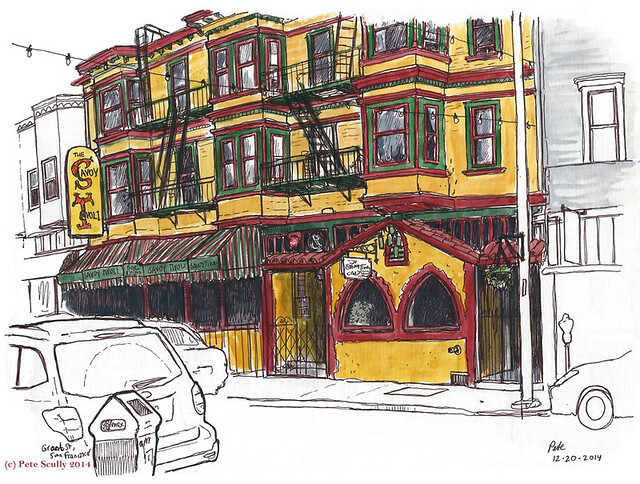 It’s called Mr. Bing’s, on Columbus in San Francisco, perched on a downward slope (or maybe it is upward, depending on where you are coming from). However, the bar has now changed; the outside has had a paint job, a large Irish tricolor flies above the window, and inside the v-shaped bar has gone and the fixtures and fittings very much along the lines of “Irish pub”. It’s different, for sure, but the bar staff were friendly and welcoming. 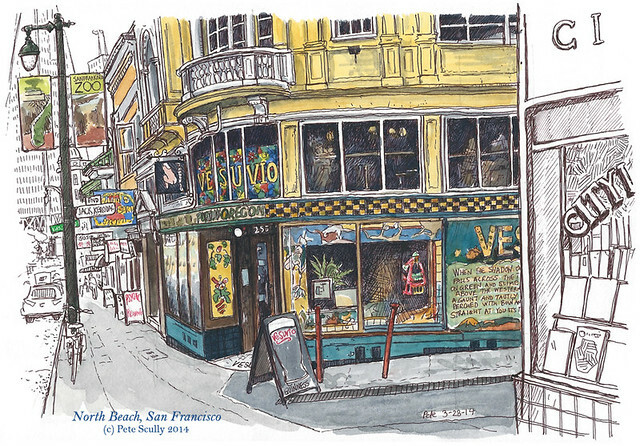 My evening in North Beach had moved along slowly. I ate later than expected, walking all the way down to Burgermeister, where I waited a very long time for a chicken sandwich, reading Paul Madonna’s new book as I did. 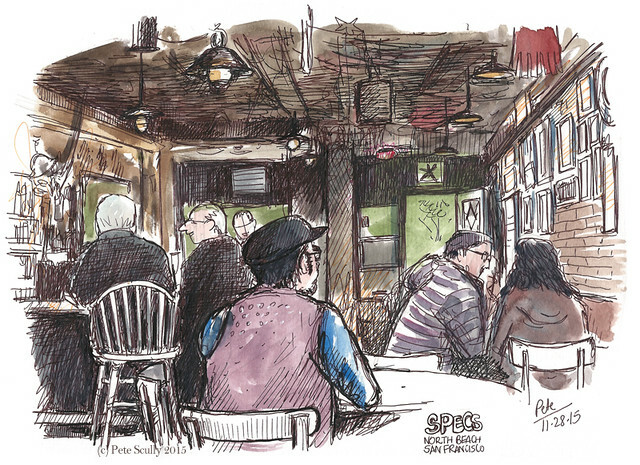 I wanted to sketch another old North Beach bar, preferably one I had not sketched before (I’ve drawn quite a few), and I walked up (or down, it’s hard to recall now) Grant Street. This place? Nah, too busy. That place? Nah, too dead. Those places? Nah, too modern. This one? Sketched it before, could sketch it again maybe, my style is different now…nah, they charge a cover, weird. So I stopped into a pub which seemed a mixture of everything, an apparently Irish pub called something like McMaggy McMollys or something, they tend to be called something like that, the not-very-Irish style pubs. 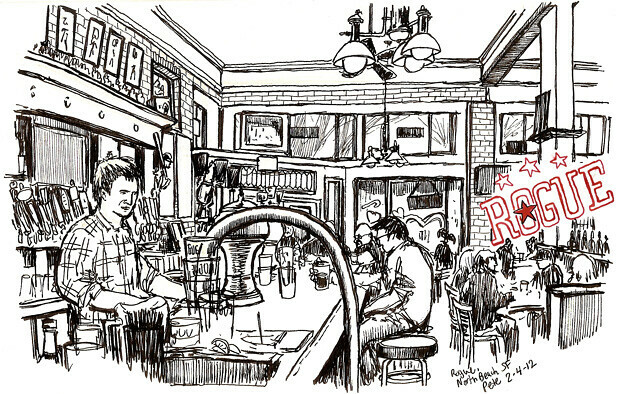 The wooden fixtures behind the bar were very clean and new looking, the music a bit loud and irritating, the atmosphere a little “whatever”, and I just didn’t want to sketch it, so I ahd my pint and left. 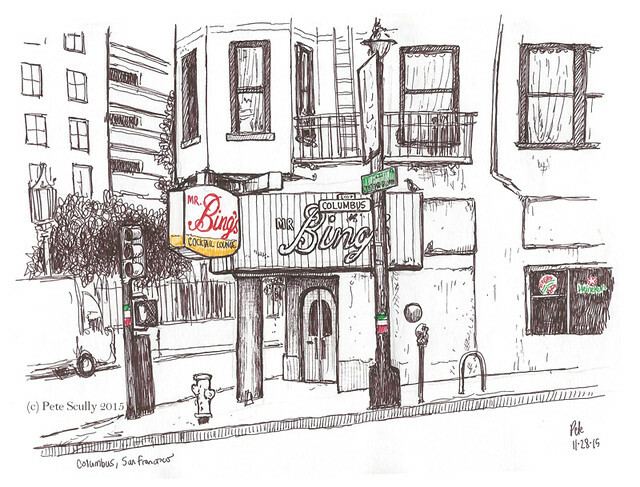 I prefer the pubs further down, Vesuvio’s, or Specs, and chose to go and finally sketch Mr. Bing’s. So you can imagine I was a little crestfallen at first to see that the old bar was changed, and the Irish theme had moved in here too. 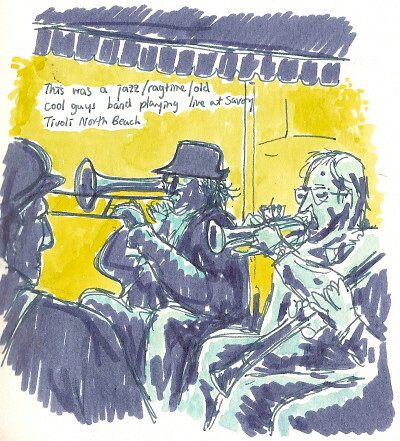 But it felt totally different to the previous pub; the barman said “hello” as I walked in, “why’ncha come in for a drink!”, the music was, well it was awesome actually, all the sort of stuff I like, bit of mod, bit of soul, bit of 90s indie, and while it wasn’t busy, the crowd was relaxed and friendly, I had a few cheerful conversations while I sketched. The light really was that red though – I added a ‘light’ red wash before sketching, but under the reddish light it was hard to tell. 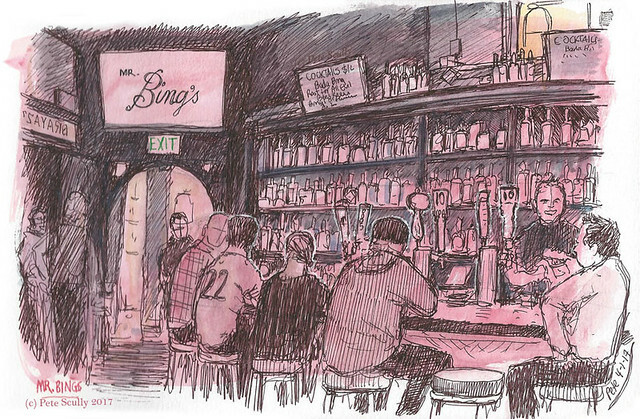 Yeah, Mr. Bing’s has changed, but it’s still a good little bar, and I tried to catch some of the character in my scribbles. I was sat on a stool holding my book, the beer was good, and it was a short walk back to the hotel. 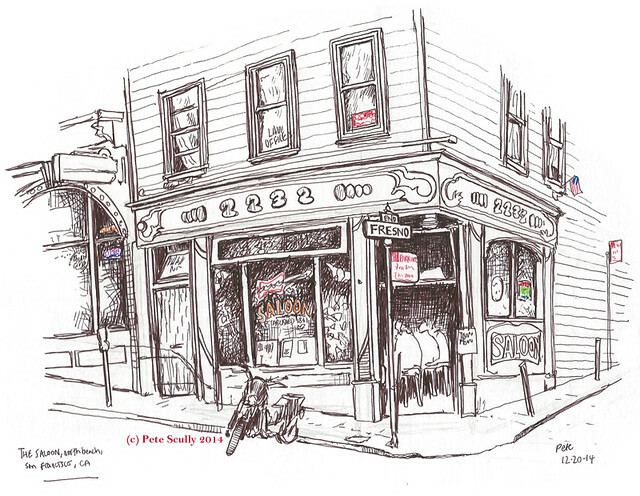 Here’s the sketch from 2015, sketched from across the street. This was before its makeover, but the sign remains the same. These are so good. I am amazed at how much detail you pack in!!!! 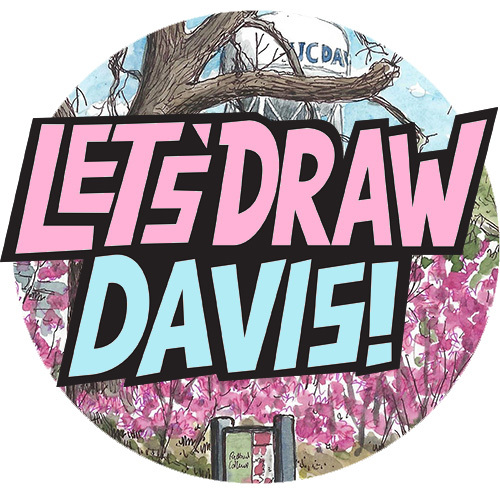 Enjoyed your drawings — which took me back to Reginald Marsh’s anarchic beach scenes. Or Grosz or Ben Shahn. Good stuff!